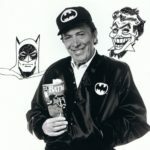 Robert Bob Kane was an American comic book writer and artist who co-created, with Bill Finger, the DC Comics character Batman. He was inducted into the comic book industry’s Jack Kirby Hall of Fame in 1994 and into the Will Eisner Comic Book Hall of Fame in 1996. "Although Bill Finger literally typed the scripts in the early days, he wrote the scripts from ideas that we mutually collaborated on. Many of the unique concepts and story twists also came from my own fertile imagination."